All Catherine wanted was to open a bakery and share her talent for baking with the Kingdom of Hearts. When she catches the eye of the King, Cath knows her dream of creating desserts for a living is in danger. Things get more complicated when the mysterious court jester comes into her life and she feels things for him she’s never felt for the King. Cath has no interest in trading her apron for a tiara but with manipulative mothers and Kingdoms at stake, Cath may have no choice. I’ve never been all that fond of Alice in Wonderland nor its retellings but I am a huge fan of Marissa Meyer. Having loved her Lunar Chronicles, I was hoping she would be able to make me fall in love with Wonderland with her take on the Queen of Heart’s origin story. And she did. Heartless is such a creative read borrowing elements from Lewis Carroll’s famous story whilst at the time weaving in different oddities and wonderment from Meyer’s own mind. I loved reading about Cath as she went from a slightly naïve girl into the Queen of Hearts most of us are more familiar with. There is a lovely sense of fairytale when reading Heartless. Courtly romances, pushy mothers, broken dreams and handsome beaus – this book does have it all. But it also has the story of a young woman with a dream which was slowly being pulled from her grasp. That in conjunction with the magical quality of dreamed elements being brought into reality was one of the thing which made this such a special read. Marissa Meyer is amazing at being able to bring together the fantastical elements of fairytales with some of the hardships these characters would face were they in the real world. Or at least as close to the real world as you can be with jabberwocks and magic. Cath’s sense of exasperation of having her dreams set aside so her mother can achieve hers using Cath as a pawn was palpable and what drove the story along. Cath knew she was getting further away from what she wanted but she couldn’t stop the life she was currently living from happening. And then there’s the romance with Jest. I loved reading Jest’s magic and his banter with Cath was a highlight but overall, I wanted slightly more feeling from both of them. But that said, I did like their relationship as it was. This book is a standalone and I loved how much story was told in the single volume. There’s not a lot of world building in Heartless with Meyer mostly choosing to borrow the world Carroll created but that doesn’t detract from the story. If anything, having this book mostly exist in the familiar Wonderland gave more time and pages devoted to exploring Cath’s relationships and story. And one of the best things about this story was how believable Cath’s journey was. From naive young woman to the heartless queen of modern legend – Meyer gave us a novel where the transformation was happening before our eyes and I could wholeheartedly believe Cath’s metamorphosis. Overall, this book was fantastic. Heartless is the kind of book you read in one sitting with no regrets. The familiar characters from Alice in Wonderland work perfectly in this book and interact so well with the characters Meyer created. The plot is interesting and not quite what you may expect. This is a book for fans of Caroll’s original Alice stories but also for those who enjoy well written and exciting stories. It was a pleasure to fall down Meyer’s rabbithole with Cath, Jest and all the others who inhabit the kingdom of Hearts. 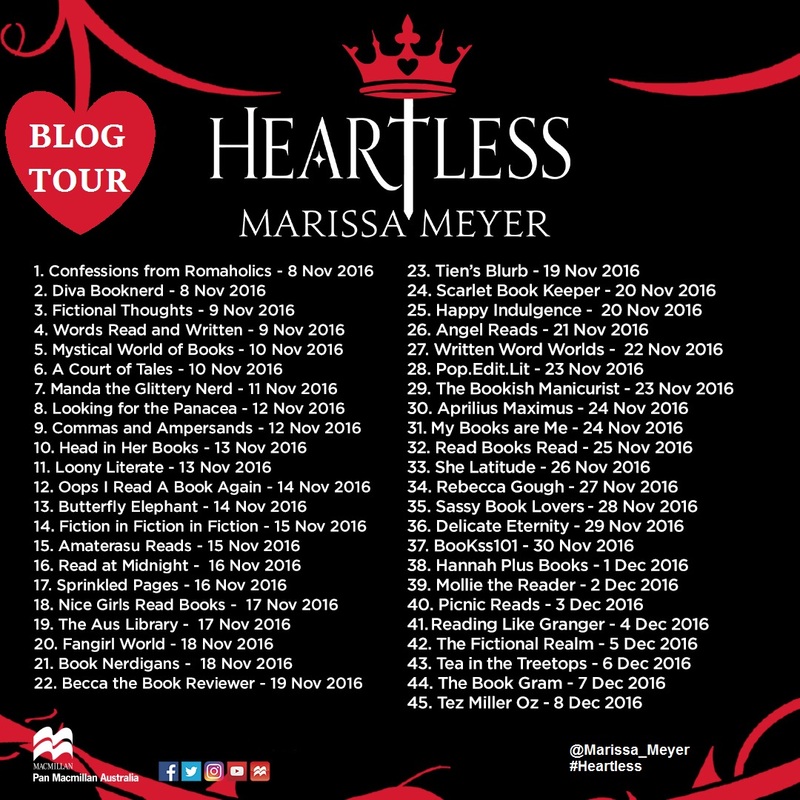 If you want to find out more about this Alice in Wonderland inspired story, check out other stops on the Heartless blog tour hosted by Pan Macmillan Australia.